Paris, FRANCE-There exists a group of Parisian men in (according to them) their mid twenties and thirties who are known for their (usually) charming quirkiness, ability to pull a party out of nowhere, and partiality to dating foreigners. One of the most popular destinations in the world, Paris attracts millions of visitors each year - a significant percentage of which return on a semi-permanent or permanent basis to master the French language, start a new life, or to simply live a dream. Many of these individuals are of the female variety, providing flirtatious Frenchmen with ample opportunity to hone their skills in international relations. 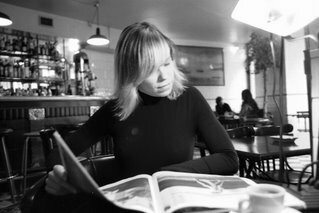 Rarely can a single foreign woman attend a vernissage, concert, book reading (not even necessarily in French) or her local café without receiving at least one request for a romantic rendezvous. Wherever foreign girls go, Frenchmen will follow, eager to try their luck at what their female compatriots would sarcastically refer to as la drague à deux francs, or cheap pick-up methods for schmoozing the ladies. Which would explain why any soirée involving the aforementioned band of parisiens resembles a United Nations convention - if U.N. officials were reputed for their funky dress. At these events, a large chunk of the globe is represented, resulting in France, Germany, Sweden, Denmark, Portugal, England, Spain, Canada, Japan, Ireland, Latin America, Hungary, Tunisia, and the United States all cavorting together on one smoky dance floor. Without ever leaving the comfort of their hometown, these Frenchmen travel through the women they woo, jet-setting with the added convenience of never having to pack a valise. "I'm through with French girls," sniffed one of these brooding Parisians with an exasperated drag on his cigarette. "We grew up in the same culture. We know each other's stories already." French couples, he argues, are familiar with one another before they have the chance to...er...really get familiar. One wonders, however, if these Frenchmen have any choice but to prey upon foreigners: many étrangères have yet to become fluent in France's official language. La drague à deux francs works much better on someone who has no clue what le dragueur is actually saying. While expats that have fallen for a Frenchman gain intimate insight into what makes the French culture tick, Parisians delight that their foreign partners offer a fresh perspective on their native city. In a way, they become tourists in their own home, visiting spots they never would have dreamed of frequenting otherwise as their lover takes in the scenery of their adopted locale. Among these couples, the role of tour guide is dual; when it's time to return home for a visit, many Paris-based expats invite their romantic interests along for the ride. This prospect can be a little scary for both guest and host: not only is there the pressure of meeting the girl's parents (who probably speak no French); two worlds collide when one reveals all of the unglamorous truths about the city (or suburb, town, village, or burg) from which one hails. "It was weird seeing my boyfriend in Stockholm," confessed a pretty suedoise who has dated a Parisian of Portuguese decent for the past six years. "It was like he was seeing a secret part of me for the first time." Others lament that it's tough enough to impress Parisians with the truly fabulous; what happens when they find out that one's hometown is small, provincial, and not all that exciting? But what's humdrum to one is exotic to another, and just because one's birthplace might not boast the stuff of movies, it can still be new and exciting to virgin eyes. Globalization, the Internet, and the alarming number of Starbucks cafés popping up all over may deem the world a smaller place, but there still remain small differences that fascinate even the most blasé. Our cultures may be similar, but they are definitely not the same, and our stories will likely hold interest past a couple of cheap pick-up lines. Long enough, at least, to really get familiar. Carolyn Heinze is a freelance writer/editor. Contact her directly at punchface@earthlink.net or through her agent, Rebecca Friedman, Sterling Lord Literistic, (212) 780-6050 or rebecca@sll.com.